Self-defense striking tools come in a wide variety of formats: Kubotans, Tactical Pens and Self-Defense Keychains. Each product can be used to strike and stab an attacker or to hit the various pressure points on the body for pain compliance. They are small, concealable and easily accessible. Great for: college students, young women, joggers, martial artists & tactical enthusiasts. 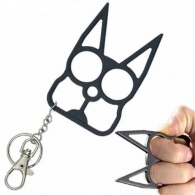 Our budget option would either the Brutus Bulldog Self Defense Keychain or the My Kitty Self Defense Keychain. They are sharp enough to poke an attacker with and hit pressure points. And they’re fashionable! One My Kitty unit has a glow in the dark option as well. We recommend getting the MUNIO Self-Defense Keychain. This tool is made of hard ABS plastic and can safely bypass TSA screenings. Comes in a variety of different designs and is made in the USA! 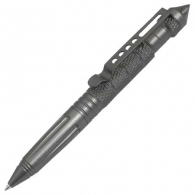 Our premium option would be Police Force Tactical Pen w/ LED Light and DNA Collector. It is a great pen that has all the functions you need: bright LED light, DNA collector and blunt point for breaking glass.